MPR: What was the impact of young voters in Minnesota? Young Minnesota voters turned out in big numbers on Election Day. Exit polls show 59 percent of the state's 18-29 year olds voted for Democrat John Kerry and that may have made a difference in Kerry's success in Minnesota. St. Paul, Minn. — Unofficial counts suggest students turned out in significant numbers. The University of Minnesota Minneapolis campus had record turnout, 65 percent higher than in 2000. Overall in 2000, almost 400,000 18-29 year olds voted in Minnesota. At the U's two polling places in the dorm lobby at Centennial Hall, and at Coffman Union, poll workers fielded questions from students with relatively minor problems. The man in charge of voter information at the U is Mike Dean. Throughout the day he trotted between the two polling places. He predicted record turnout early on. About 100 students were lined up at Coffman Union before the polls opened at 7 a.m.
"I've never seen anything like that," he says. "Especially on a college campus, because quite honestly, a lot of students don't get up early. They're pretty much night owls. So for them to get up early is kind of unbelievable. But it also shows people's passion about this election, and interest. I think that's very exciting." This is a clear possible strength in the future for the Democrats. But they have work to do if they want to solidify this party loyalty on the part of young people who did vote for Kerry. The majority of students interviewed said they voted for Democratic candidate John Kerry. And it was the presidential race that brought them to the polls. Senior Scott Yilek, 21, says he voted for Kerry because he hasn't been happy with President George Bush's record over the past four years. "He's had his chance. He's had a Republican Senate, Republican House of Representatives, he could have put through any law he wanted, and we've had loss of health care loss of jobs, and the country's just a lot worse off with him as president," according to Yilek. At the University of St. Thomas in St. Paul, students were offered shuttle bus rides to a polling place at the Church of St. Mark, about half a mile from campus. Student Mark Hoerr, 19, followed his parents lead when he cast his ballot for George W. Bush. "I'm not that informed on politics. But just basically I thought he did a good job. My parents are more towards Bush, so they just kind of informed me and said that you know this is what he does, so I just kind of agreed with 'em. He stands for less government," he said. 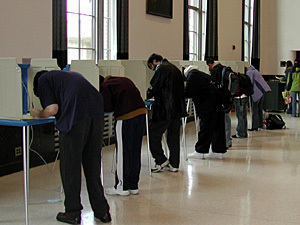 Many students showed up to vote with their friends and roommates. St. Thomas freshmen and dorm acquaintances Ashley Goplin and Stephanie Beadell both voted for John Kerry. This was their first time to vote in a presidential election. They say lots of their friends voted, too. "I think it's very contagious. I think the more signs we see, the more people are... I've heard of a lot of people deciding that now they're going to vote. And I think it's more specific issues inspiring students to vote, too. Whether it's abortion or Iraq, it's usually one major issue that gets people going and thinking about voting," they said. Minnesota college-age students have a recent history in the state of making an impact when they vote. In 1998, Gov. Jesse Ventura's win was attributed in part to high voter turnout among young voters. Metro State University political historian Doug Rossinow says 2004 appears to be the year of the young voter, and offered opportunities for Democrats. "You always look, or at least the losing party always looks for the silver lining in the cloud. And usually looks for possible strengths in the future to build on. This is a clear possible strength in the future for the Democrats. But they have work to do if they want to solidify this party loyalty on the part of young people who did vote for Kerry," according to Rossinow. Rossinow says it's been a long time since Democrats were identified as the party of the young.